Here I am again back from my holiday in California and what a wonderful place it is. The whole holiday was filled with so many fabulous things and I really didn't want to come home. The Americans are so friendly and helpful, and the weather was glorious. It was 75* when we set off for our flight home and that was at 6.30AM.....then we got back to England (21 hours later) and it was so cold. Brrrrrr! I got to meet a lady that visits my website and it was lovley to meet up with her. I had suggested we could meet and have a "natter" over some coffee. She told me it took her a whole hour to find out what a Natter was. It's just a chat for others who don't know what one is, and it's a common English term. Any way as a result of my adventures this will be a short newsletter...but I will make up for it next month. I hope you like it and will give it a try, it's not hard and I have kept the instructions easy to follow. In the coming weeks I will be adding more to the section on Wedding Stationery and all the various items that go to make up that category. In these days of recession more and more people are turning their hands to cardmaking and this particular area is very popular. So for those making their wedding plans, or for those of you that make items for others, I will be starting soon with some ideas to get the best from your skills, and creating something you will be proud of. The Blending Tool is such a popular item that I have decided to add it again this month, for those that missed it last month, or for new visitors to the newsletter. It is a piece of equipment that is so useful to have for any one that loves to add inked or distressed looks to their cards. 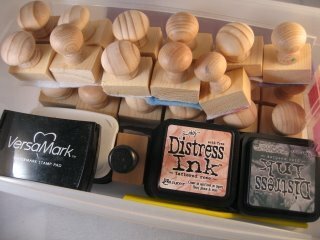 It is not a big in size, and yet can be so expensive to buy....especially if you need several for all your different ink pads. Once again there has been a good increase to the email I have had from people all over the world. I want to say "thank you" to everybody for all your news, chat and questions, please keep them coming. I am only to willing to help wherever I can. Don't forget you can visit...card-making-magic.com on "Facebook" and here is the direct link to the page. Once you get to the page you will see a "like" button alongside the title. By clicking that button you will help to grow the list of fans to the website.